BHUBANESWAR ENGINEERING COLLEGE (BEC) is a Co-Educational Institution specializing in Engineering and Technology under Koustuv Group of Institutions is to serve as a source of highest learning with the objective of taking the light of knowledge to the depths of darkness, enriching the deprived by serving them with learning which is the greatest of the world's resources. BHUBANESWAR ENGINEERING COLLEGE (BEC) was established in 2008 and is being managed by Nabakalebar Charitable Educational Trust with the mission to "create engineering minds capable of mastering the global challenges of tomorrow's technology". The Institute is approved by the All India Council of Technical Education (AICTE) under MHRD,Govt of India and is affiliated to Biju Patnaik University of Technology (BPUT). The lush green campus comprises of 27.5 acres of land and located at the picturesque about 4 kms from International Airport Bhubaneswar. The Institute has been growing up by leaps and bounds under the able leadership of the founder Er.N. K. Mallick, Patron-in -Chief, Er.Prabhat Ranjan Mallick, Chairman KGI, Er. Alok Ranjan Mallick, Vice Chairman KGI & Chairman BEC. About 1500 students are studying in various disciplines of B. 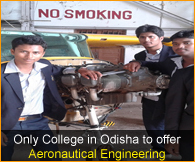 Tech (Aeronautical Engineering, Mechanical Engineering, Civil Engineering, EE, EEE, ENTC, CSE,)M.Tech (CSE, MECH, ,EEE), MBA & Diploma in Engineering(Aeronautical, Mechanical, Civil Engineering) in BEC. The entire campus is equipped with 24x7 Wi-Fi connections, Lawn Tennis court, Basket Ball court, Swimming Pool, Cricket ground, Paragliding, Gymnasium with a plethora of eco-friendly zone where human being and Nature coexist in a rare ambience away from the dust and grime of city life.